Consider being part of the 2019 team! Every summer a passionate, gifted and amazing staff is hired to make Silver Lake an inspiring place for children and youth to have fun, grow in faith, and to experience the best week of their summer! Throughout the summer, volunteers join the staff in counselling and site roles. 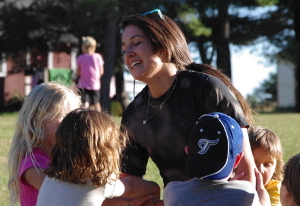 Staff care for campers and act as role models through the adventures, games and faith formation of each day. Along the way, staff experience God, grow in leadership and often receive as much (or more) than they give. Staff Hiring for Summer 2019 is now OPEN! Please take time to think, pray, and discern where God might be calling you this summer! Please click on the link above to access our NEW online application portal for new and returning staff. The Reference Form (for new staff only) is also available at the link above. All applications and references are due February 17, 2019, 11:59 pm. Please note, returning staff are not required to submit a reference form, but must include two reference contacts in their application. Once we have received your application we will contact selected applicants to set up an interview. Interviews will take place at Calvary United Church in St. Jacobs and/or Wellington Square United Church in Burlington. Interviews are scheduled for February 23, 2019, and March 2, 2019. Please be aware that you may be requested to come in for an interview on either day. If you have any questions, please do not hesitate to contact us by email at slcdirectors@gmail.com. For 50 years, Silver Lake has been a favourite summer destination for children, teens and families looking for a fun, caring and inspiring camp experience.